My name is Jenell Quigley. 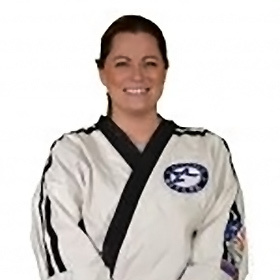 I reside in the Northland with my husband and my son, who is also a karate student with ACTIVSTARS. I joined the program in 1995 as a white belt when ACTIVSTARS arrived in Kansas City. After seven years of training, I earned my Black Belt in Shotokan Karate. I then joined the ranks with my instructors and started teaching around the Northland in 2001. After ten years of dedication to my students, I took a short break to raise my son. I am happy to say I am back and teaching again.